Harold Kenneth Campbell, aged 19 years and 5 months, enlisted in the Australian Imperial Force on 29th June 1915. His parents gave their written consent saying he had “been raised to fight for his King & Country”. His father, James Spink Campbell, of “Beverley”, Blaxland, was named as next of kin. Harold’s occupation was poultry farmer and James was a civil servant. Harold fought at Pozieres as a Private in the 3rd Battalion, sustained gunshot wounds to his knee and leg and died as a result of his wounds in the General Hospital, Rouen, on 2nd August 1916. He is buried at St Sever Cemetery, Rouen. 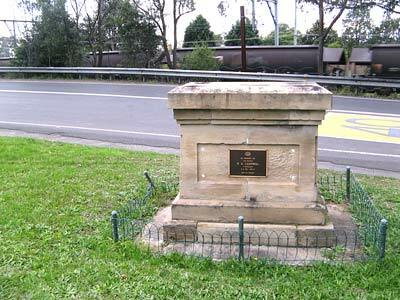 On 22nd October the Blaxland Progress Association requested permission to erect a Soldier’s Memorial at the intersection of Railway Parade and Station Street, Blaxland (that is on the north side of the Railway Station) opposite the station in full view of passengers in passing trains. Permission was granted. It was to be a stone or granite pedestal with a machine gun mounted on top. The monument was unveiled in 1925 with about 200 people assembled. Councillor Wilson made a speech in which he said that it would “stand for ever as a beacon for the boys of the future to do their duty as the fallen hero had done his”. The machine gun was one of a number of German guns seized in France. The monument was unveiled by Major General Sir Charles Rosenthal, a local highly decorated soldier. Councillor Wilson took the opportunity to collect donations to finish paying for the cost of the memorial. In the 1980s when the Highway was widened the monument was again moved and is now stranded on a narrow strip of land between the overhead bridge on Wilson Way and the Highway where it is difficult if not impossible to access. The park is also difficult if not impossible to access. Over the years the plaque(s) and the gun on the monument have disappeared and the Blaxland – Glenbrook RSL Sub Branch who have assumed a de facto ownership of it have, with the help of the Blue Mountains City Council, organised restoration and refurbishment, replacing the plaque and repairing the little fence at the base. 1. a move to a more accessible site would be desirable. We thought it was quite unusual for a World War I memorial to be erected for a single fallen soldier. Honour Boards and Monuments in the Blue Mountains were erected in memory of numbers of men (and a few women). Perhaps Harold was the only Blaxland man who enlisted. Four other men, born in Blaxland, were located in the World War I Nominal Roll; two enlisting in Cootamundra, one in Lithgow and one in Sydney, but nothing further is known about them. Blaxland was a very small township and Harold would have been quite well known locally. His parents, James and Edith, and sister, Edith, lived in a house called “Beverley” which was situated where the Blaxland Arcade now is. The house was named after James’ family home or rather property in Boorowa, NSW. James and Edith were active community and Church workers. James was treasurer of the Urban Area and Progress Association for many years and he and Edith were strong supporters of St Davids Church of England in Taringha Street. They donated the block of land on which the Church Hall was built and they set up a Memorial to their son in the Church. Unfortunately the church was destroyed in the 1968 bushfires. James could claim a very interesting and prestigious pedigree. His maternal grandfather was Rowland Hassall, an early colonial preacher and farmer. His paternal great great grandfather, William Campbell, was a colourful sea captain who owned a ship called the “Harrington”. He had trade connections with John Macarthur and settled in Australia after receiving a land grant of 2000 acres near Camden. He named his property, “Harrington Park", and there is now a suburb with this name. The homestead still stands and is being restored. The Fairfax family are thought to have been the last private owners. The Hassall and Campbell family members married into other well known colonial families including the Antills (Captain Henry Antill was Governor Macquarie’s ADC) of “Jarvisfield”, Picton. They also frequently married cousins so their family tree is scattered with the Campbell and Hassall surname. James Spink Campbell was married twice, first to Gertrude Williams of Yass. She gave birth to a son, William Douglas Adye Campbell in 1883 and died in the same year. James married Edith Deacon at Ashfield in 1894 and they had two children – Harold and Edith. Edith married John Back and they lived in Sydney for a time before moving back to live in “Beverley” in Blaxland in 1942. They had three children, Josephine, Kenneth and Shirley. Kenneth became Vice Chancellor of James Cook University in Townsville. He married Patricia Cummings, daughter of Regner Olaf Cummings, who was a noted tennis player during the Hopman era. They currently reside in Queensland (see attached note). After serving with the military forces in World War II, Josephine married Francis Clement Murray. Shirley married veterinary surgeon Marcus Richard Edward Durand. In the Hassall family tree on Ancestry.com James’ second marriage and children are not recorded. William, the son of his first marriage, is noted as the family historian. He died in 1966. Does this indicate a family disapproval of the second marriage? We don’t know. With his privileged family background and his position in the tiny Blaxland community he would have been well known and respected and his loss of a son would have been felt by all – hence the erection of a community memorial.